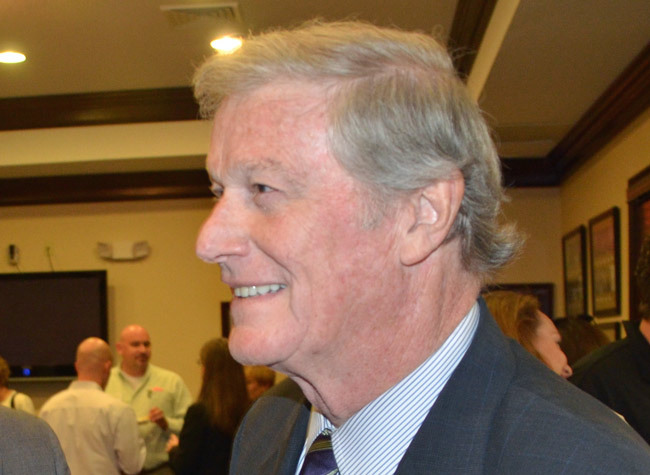 State Sen. John Thrasher, the St. Augustine Republican whose district includes Flagler County, will join the Flagler County Chamber of Commerce and the county’s economic development department as special guest and speaker at the “Think Flagler First” lunch on Friday, November 15. The event will take place at the Grand Club at Pine Lakes, 400 Pine Lakes Pkwy N in Palm Coast. The senator will share insight about the 2014 legislative session, answer audience questions and congratulate the chamber’s 21st class of Leadership Flagler graduates. Registration will begin at 10:45 a.m., with lunch at 11:15 and the presentation beginning at 11:30. The event is sponsored by Florida Hospital Flagler. Cost is $25 for chamber members with advance registration and payment, or $35 the day of the event. Guests are welcome to attend for $35 with advance registration, or $45 at the door. Seating will be limited, so please call 386/437.0106 to reserve your spot before Tuesday, Nov. 12. Chamber members can also register online here. I’m sure when Thrasher and the Chamber say “Think Flagler First” they means the rich Henry Flagler, not the Henry Flagler after he went broke.